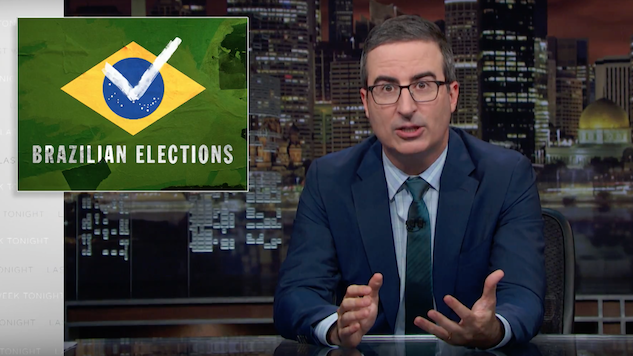 Watch John Oliver Tackle Brazil's Presidential Election and the "Brazilian Trump"
John Oliver tackled Brazil’s controversial election in his latest episode of Last Week Tonight. Brazil is teetering on unsteady ground to begin with, both recovering from a terrible recession and maintaining crime rates so high they’re hard to comprehend (with 30 percent of citizens in Rio reporting having been in the middle of crossfire in the last year, according to Oliver). Now, the country is dealing with the choice between Congressman Jair Bolsonaro and former Sao Paolo mayor Fernando Haddad for president, and according to Oliver, they’re not leaning in the right direction. Sunday held the first round of voting, in which two scenarios were possible: Either two candidates to be chosen between later this month in the run-off election would emerge, or, in the case that one candidate got over 50 percent of the vote, Brazil would end the night with a new president. Oliver examined both candidates, starting with Haddad, who is basically running as a replica of his party-mate and former president-turned-prisoner, Luiz Inácio Lula da Silva (“Lula”). Pointing to statistics saying that Lula would probably win if allowed to run again for president while in prison, the comedian sympathizes with Brazil. Unfortunately, many of Brazil’s citizens don’t seem to be quite as supportive of Haddad as they are of Lula and are instead coming out in droves for far-right candidate Bolsonaro. Much of the rest of the segment pulls video of Bolsonaro saying all kinds of ridiculous things that generally wouldn’t be allowed, like threatening to harm a congresswoman and confusing Ellen Page with blatant flirtation (“Do you know how hard it is to confuse Ellen Page? She was in Inception, that should be simply impossible”). As of the taping, results of the election weren’t yet finalized, though Bolsonaro did end up claiming 46 percent of the vote, with Haddad trailing at just over 29 percent, so there will be a run-off election.